Supernatural star Jensen Ackles directing “Weekend at Bobby’s.” Photo: The CW. Supernatural’s Jensen Ackles is more than a pretty face. He’s a skilled actor who can convey complex emotions, deliver dialogue with great humor, and scare the bejesus out of the viewer. Ackles’ portrayal of Dean Winchester on Supernatural has contributed to the program’s decade-long success. Directors have the responsibility of ensuring that the narrative is being told in a coherent manner. The director takes an idea from script to screen, by overseeing the performance and visuals. They conceptualize the story and make decisions that support that vision. Ultimately the director manages the pace and flow of the story, making decisions about how scenes will be shot and what the focus will be. One of the practical aspects of the director’s work is prioritizing needs in order to stay on schedule. Directing also involves working with a team of experts, and bringing out the best in them. The director will share how a particular scene should look or feel, but utilizing the expertise and ideas of those on set can be extremely valuable if the team understands the vision the director is conveying. This is particularly true of a long-running television show like Supernatural that has an established framework. The benefit of having Ackles take on the role of director is that he understands the lexicon of Supernatural far better than most. “Weekend at Bobby’s” was Ackles’ directing premiere. A fantastic script starring the skilled actor Jim Beaver (Bobby Singer) provided an excellent opportunity for Ackles to get his feet wet in the world of directing. Though Ackles did play his character Dean Winchester in the episode, his time on screen was minimal compared to most episodes, providing him the space to focus on directing. 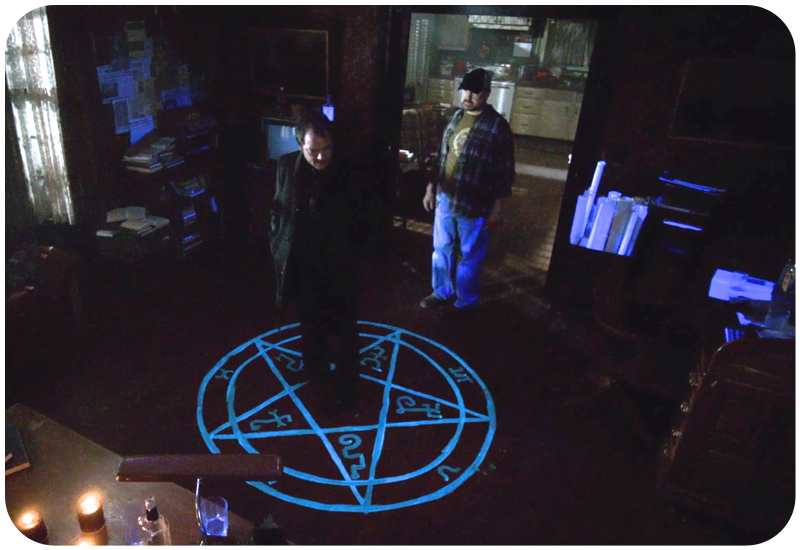 “Weekend at Bobby” follows Bobby’s efforts to get his soul back from Crowley (Mark Sheppard). One advantage of this script is that “Weekend at Bobby’s” takes place primarily through interior shots at Bobby’s house, though there is a very complex action scene that takes place outdoors at night involving a woodchipper. There’s a fair amount of important dialogue delivered over the phone, yet the actors really make those scenes work. “Weekend at Bobby’s” showcases the talents of Jim Beaver, not just because the episode focuses on him, but because he makes everyone he shares a scene with that much better. 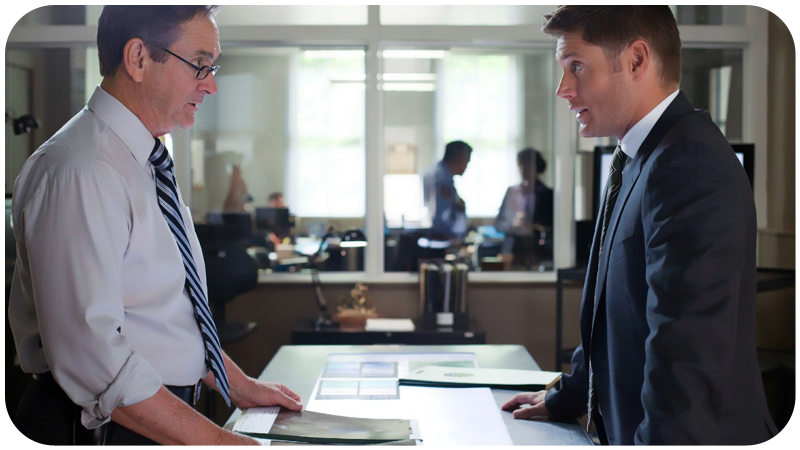 Ackles is no slouch when it comes to comedic acting. Thus, the fantastically funny “Weekend at Bobby’s” is a great choice for him to direct. Ackles understands the humor of Supernatural better than anyone, and the comedic aspects of the script are emphasized, making the episode that much better. The interaction between Bobby and Rufus Turner (aka Luther Vandross aka Ruben Studdard) (played by Steven Williams) is hilarious. It’s fun to see Jody Mills (Kim Rhodes) develop into an ally. Mark Sheppard and Beaver are electric together, both managing to be truly threatening in the midst of their biting sarcasm. Even flirtatious neighbor Marcy (Jennifer Aspen) adds some humor. The story clearly conveys the reliance that the boys, and the hunting community, have on Bobby, and how much they can take him for granted. We get a research montage and see the less glamorous side of hunting as Bobby breaks into the library and advises other hunters. “Weekend at Bobby’s” was a terrific start for Jensen Ackles as director. Sam and Dean find themselves at Sioux Falls General Hospital, from which they must escape some Leviathans, the Season 7 foes from Purgatory. As Dean heals from an injury Sam checks out signs of a kitsune (though the eating of human organs seems more kumiho than kitsune). Dean is worried about Sam’s continuing hallucinations of Lucifer. As Sam tracks down the kitsune, Dean tracks down Sam. The story also has flashback scenes to 15-year-old Sam. Though Dean is a big part of the story, it’s a Sam-heavy episode, reducing the amount of time Ackles would normally be on screen. In Season 7, the production team started the practice of filming the episode Ackles would direct prior to any other episodes of the season in order to give him more time to prepare. Despite less overall screen time, Ackles was in a lot of different scenes. The complex storyline creates a lot of brief scenes in a variety of locations. 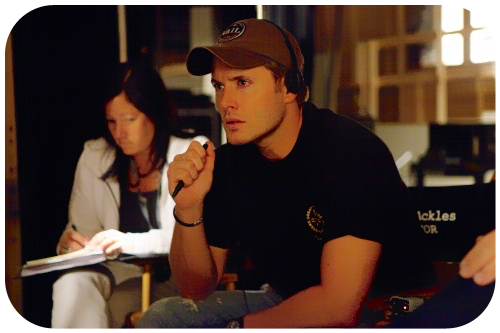 In interviews, Ackles talked about the challenges of directing so many individual scenes. Normally in a Supernatural script there are 40–50 scenes, but in “The Girl Next Door” there were 78. The pacing of the episode is very fast (which is something to be grateful for when the disliked Leviathan storyline comes into the episode). The slower pace Ackles uses during the scenes between Sam and Amy help to give the story more of an emotional punch, creating both an engaging and cohesive narrative. “Heartache” is a Monster of the Week story focused on a string of murders connected by organ donation. It also explores Dean’s resentment towards Sam for not looking for him in Purgatory and Sam wanting a “normal” life. “Heartache” was the least engaging script among all the episodes Ackles directed, yet the story’s action moves the viewer along without getting bogged down by plot challenges. “Heartache” moves along at the pace of their fast-moving investigation. The viewer can clearly see the tension between the brothers in the scenes that focus on the overall season story, but they never drag the monster-hunting down. Though there is dialogue about their relationship, Ackles and Padalecki convey much of the characters’ feelings through non-verbal cues and the tone of the dialogue. “Heartache” followed the previous season’s practice of shooting the episode to be directed by Ackles first in the season, even though it would air third in the series. The episode also had fewer scenes than “The Girl Next Door.” Despite these advantages, Ackles was faced with the challenge of having a much larger role in the episode than he had in the two previous episodes he directed, which clearly centered on other actors. Through his directing, Ackles was able to highlight the humorous aspects of the script, use shots that focus on the dynamic between the Winchesters, and convey aspects of the story beyond the dialogue. “Heartache” provided a new challenge for Ackles, who directed his father Alan Ackles in the episode. Alan Ackles played Detective Pike, with whom Dean Winchester has a bit of antagonism. At the 2014 Jus in Bello Convention, Dean talked about his father being part of “Heartache”: “He gave a little speech after he was done shooting to the crew that brought a few of them to tears—just how thankful he was that they had been such a family to me. It was a real pleasure just having him on set and getting to work with him. There wasn’t a whole lot of directing. I kind of let him do what he does and I didn’t need to direct him.” Ackles’ mother Donna was also on set, playing an extra in a background scene. “Soul Survivor” aired as the third episode in Season 10, though it was the first the crew shot. Though the schedule allowed Ackles time to do his directorial homework before the season began, he was faced with the challenge of playing a new character, Demon Dean, while also directing. In interviews, Ackles talked about how this made “Soul Survivor” the most difficult of all his directorial experiences. It takes creativity and mental effort and investment to play a new character, just as it takes a lot of additional effort to direct. Ackles did a lot of extra prep for “Soul Survivor” to free more of his mental energy to create the character of Demon Dean during filming. Ackles’ depiction of Demon Dean is pretty terrifying. The sound effects overlaid with his growls make him even scarier. Music was used to a lesser degree compared to most episodes, but when it was it had an emotional punch, such as using the Winchester brothers theme as Sam looked at their family pictures. 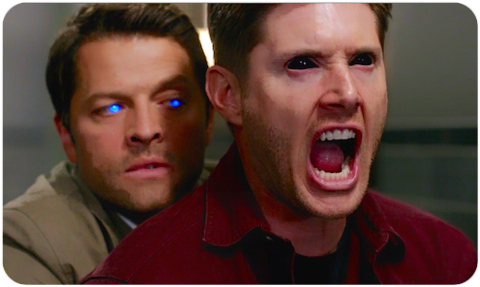 There are a lot of close-ups on Demon Dean’s face, showcasing how differently he plays the character than he does Dean. “Soul Survivor” was a fairly dark episode in terms of content and lighting, with moments of lightness from the angels. Between the bunker and Crowley’s Hell, there are a lot of dark, interior scenes in “Soul Survivor.” Yet there was some great imagery in both spaces, with a demon lighting himself afire in Hell and a chase scene showcasing the angular architecture of the bunker. Interspersed with the dark Hell and bunker scenes were the outside shots with angel Castiel (Misha Collins) and Hannah (Erica Carroll). The heartfelt dialogue between Hannah and Castiel was framed with sunlight and greenery. “Soul Survivor” was an outstanding episode of Supernatural, and was Ackles’ best directorial effort to date. In the upcoming third episode of Season 11, the characters will still be learning just what the Darkness is and what it wants. “The Bad Seed” will serve as an expositional episode as Sam and Dean search for a missing baby, Rowena (Ruth Connell) attempts to consolidate power, Castiel tries to find a way to heal, and Crowley attempts to use the Darkness for his own gain. “The Bad Seed” will explore these different points of view, moving that story along and advancing the mythology of Season 11. As the story will portray several different storylines with quite a few major characters, ideally it will lessen the acting load for Ackles in this episode. His challenge will be to present the various subplots in a manner that creates a coherent story. It also seems reasonable to expect a variety of locations, transitions, and effects. “The Bad Seed” will give Ackles a chance to utilize his directing skills to bring together various characters’ stories to create an overall narrative that will contribute to the season arc. Based on the strong work we’ve seen from this talented director so far, Jensen Ackles seems up to the challenge.